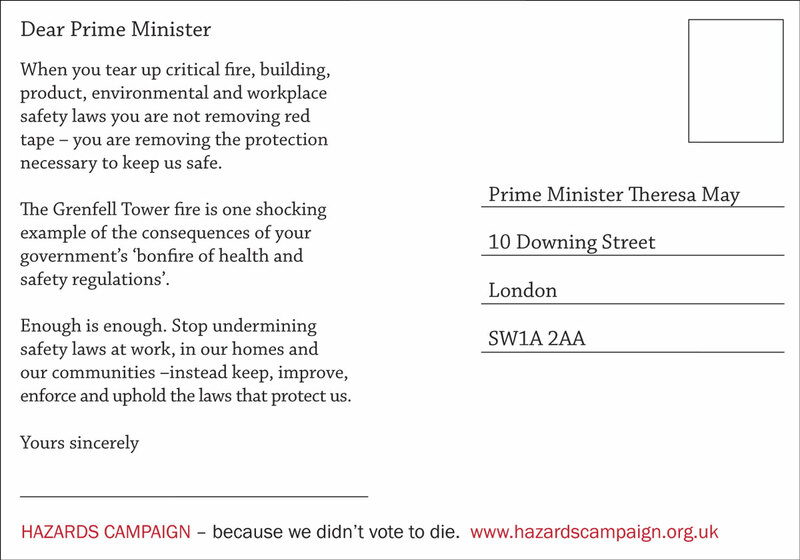 Hazards Campaign rejects BERR Report ‘Improving Outcomes from Health and Safety’ as it is not about making workers lives safer or healthier, but is part of the government’s deregulation promise to business – to reduce regulation by 25%, have a moratorium on new regulation and save alleged millions of pounds for employers. This is despite the fact that the number of H&S regulations have halved in the last 13 years. The report and associated documents is an example of the dumbing down health and safety. A spokesperson said: “The Hazards Campaign would welcome with open arms a report which really did what it said on the title page -improving H&S outcomes. But this BERR report ‘Improving Outcomes from Health and Safety’, is so far from what is urgently needed from the government to address the appalling state of health and safety that many workers experience daily, that we feel it is a waste of time and money. The idea that the ’average firm spending 20 hour a year and over £350 a year on meeting the administration costs of compliance with the Management of Health and Safety regulations’ is being over burdened when this equates to less than 4 minutes per day, is so ludicrously stupid it can only come from a pro-business zealot more interested in urban myths than the hard evidence of workers bearing the burden of illness and injury. “As we are all being squeezed by the global recession due largely to the unregulated dealings of the financial business sectors, to call for more deregulation sounds amazingly reckless! 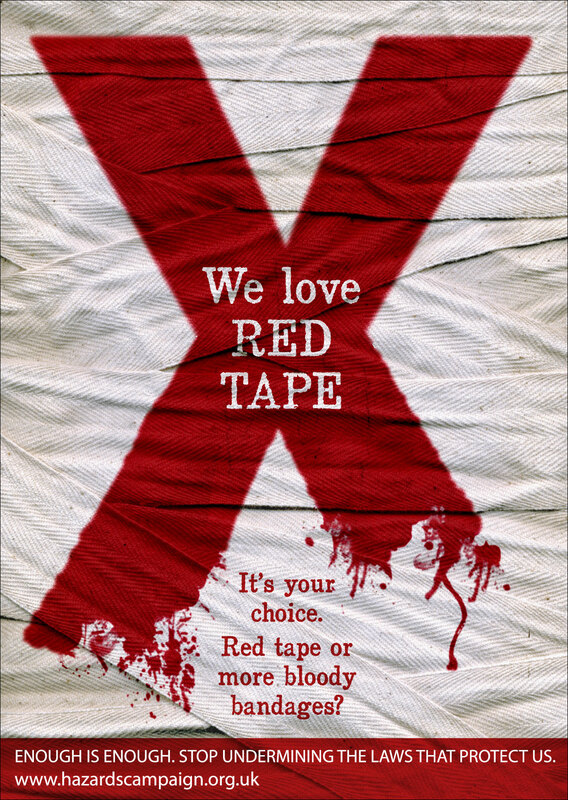 For this to come shortly after the House of Commons Public Accounts Committee report stated that the Better Regulation Task Force has vastly overestimated claims of savings from cutting regulations, this call for yet more deregulation of H&S to save employers time and money seems to comes from a government bizarrely unable or unwilling to put people’s lives and health before the perceived needs of business, and which prefers to fiddle while the country burns. There is no corresponding calculation to illustrate the cost of non-compliance for example the cost to an SME of making one worker ill with MSDs from incorrect manual handling, or working badly at a computer. This call for yet more deregulation of H&S to save employers time and money seems to comes from a government bizarrely unable or unwilling to put people’s lives and health before the perceived needs of business, and which prefers to fiddle while the country burns. The Report purports to concentrate on low risk SMEs where the risk of illness or injury is low, but in fact many of the sectors covered have a high risk of musculo-skeletal disorders such as Hotels and Restaurants, Wholesale, Retail and Repair and office work in the Finance and Business sector; the Education sector has a high risk of work-related stress. The report is also utterly silent on almost other types of occupational illness, especially long latency diseases such as asbestos related disease, cancers, respiratory and circulatory diseases. Using only HSE official figures of accidents at work, the report ignores all those work-related deaths on the roads and also the huge burden of occupational illness which accounts for up to 50,000 deaths a year. An amazing burden on working people the government seems only to keen to add to while making it easier for non-compliant to criminal employers to continue getting away with it. ‘The Perceptions of the H&S Regime’ report conducted by Vanilla Research shows how businesses often report feeling over- burdened but mistakenly conflate H&S with other regulations, rely on second, third hand or hearsay information, rarely seeking out definitive facts themselves from well publicised sources, and apparently not intending to ensure they are complying with basic laws anyway! Yet this whole process aims to normalise the process by which health and safety is downgraded and treated as nothing more that common sense. Would that it were so, but understating how to work safely at a computer to avoid developing MSDs, or that work that creates silica dust can cause cancer, isn’t just common sense. We doubt that companies openly saying 100% compliance with taxation laws was impossible would be acceptable. The truth is we cannot afford employers lack of compliance with H&S that costs workers so dearly, the whole economy possibly up to £60 billion per year yet the cost to an employer for record keeping is a measly £350 a year and less than 4 mins a day. “Asking the HSE to provide more advice and information to SMEs, may be a fine idea but as the HSE cannot cope with existing workloads and there is no mention of the essential role of enforcement in gaining compliance, or the need for massive injection of extra resources to do both roles, this is fairly meaningless. The report purports to be about improving H&S but is fairly clearly being promoted as a way to save employers time and money and as such is unlikely to make anyone safer or healthier at work, but will reassure employers than applying so called ‘common sense’ with no need to find out what their legal duties are, is actually perfectly acceptable behaviour. As many tragic examples show, common sense by employers is frequently in very short supply and did not protect workers from death – Steven Burke, Daniel Dennis, Andrew Herbertson, Craig Whelan and Paul Wakefield, Mark Wright, Andrew Hutin, Lewis Murphy, Samuel Adams, the nine people killed in the ICL explosion, Christopher Knoop, to name but a few see www.fack.org.uk and www.hazards.org/deadlybusiness. “The Reports main findings include that coverage of H&S in the media is often negative but seem unaware that the report itself contributes to this by portraying H&S as ‘only common sense’, and as a burden, allegedly costing employers £millions, and which must be removed! It recommends (recommendation 3) developing a more active media strategy to show the benefits of good H&S and consequences of poor H&S but fails to suggest learning from Families Against Corporate Killers (FACK) the Asbestos and other victim support groups and Hazards magazine as successful proponents of this approach. “Recommendation 1 includes a long term Hazards Campaign demand by suggesting the HSE considers making more of its guidance free to download.